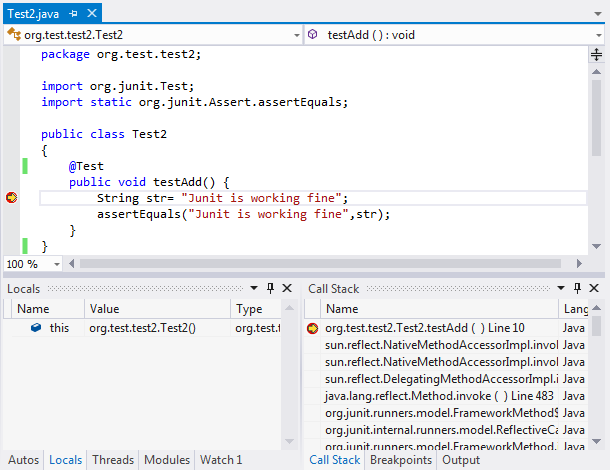 Ant project with configured JUnit tests is opened in Visual Studio. You can find instructions how to create an Ant project in this section. You can also find more information on how to configure JUnit tests in Ant project in this section. You can now debug your testing code. The IntegraStudio debugger supports all standard Visual Studio debugger features, except native-specific ones like Disassembly, Memory and Registers. Howerver, we also plan to implement Disassembly in the future as bytecode disassembler. This feature is considered lower importance, though.